The GP grapple processor head by Pierce Pacific allows a single carrier to accomplish tasks that normally tie up two machines. The Forest Resources Assoc-iation expressed its frustration over the Department of Labor’s (DOL) arbitrary decision to stop issuing guestworker visas. FRA has been leading advocacy efforts on behalf of the forestry sector to persuade DOL to change course. “We are absolutely at a loss to understand why DOL would take such an economy-disrupting step,” Hawkinson said. FRA has taken its concerns to Capitol Hill, where numerous members of Congress from both parties and in both chambers have already communicated their opposition to DOL’s guestworker visa stoppage. Group letters are now circulating in both chambers urging the department to change course and to support the Department of Homeland Security, which actually has the authority to regulate the H-2B program. 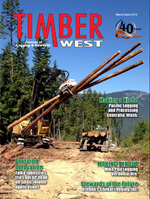 The Idaho Logger reported that as of 2015 “employers are required to report to OSHA more types of workplace injuries, and employers should expect an increase in enforcement inspections. All work-related fatalities must continue to be reported within 8 hours. For detailed information on the change, visit www.osha.gov/recordkeeping2014/OSHA3745.pdf. The American Forest Resource Council (AFRC) reported in February that under Obama’s Fiscal Year 2016 budget the Forest Service would receive $1.94 billion, down from $5.07 billion in 2015, and 48 percent would be dedicated to wildfire suppression activities. It also proposes to increase timber sale outputs from the current 2.9 bbf up to 3.2 bbf, although it’s unclear how that would be accomplished. The new budget relies on Congress passing the Wildfire Disaster Funding Act (WDFA), which will trigger the use of emergency firefighting dollars for the largest wildfires. The budget assumes $173 million in increased funding if these emergency funds were made available. To view the full article, visit www.amforest.org/images/pdfs/AFRC_Newsletter_2-25-15.pdf.